Select from dozens of predefined reports, or create your own report layouts using the Custom Report. Print most reports directly to the printer or PDF file or a text file. The Books reports can be printed to RTF (readable by most word processors, including MS Word) or WordPerfect format. Most reports have an impressive list of options to choose from, so you can get just the information you want in a desirable format. Use the Preview option to see whether the options you have selected will produce the end result you are after. You can even print reports in any language in the world, once you create or obtain a language module for that language. Pedigree Chart -- The Pedigree Chart is easy to read and informative. Charts can be 'cascaded', so that you can print your entire ancestry on a series of charts. Fan Charts -- The fan chart is simply a circular format of a Pedigree Chart. You can print up to 13 generations, and on paper sizes as tall and wide as you can find a plotter (look to your local high-tech copy store). Family Group Record -- The Family Group Record can be customized to show just basic information, or all your additional events, notes, sources, etc. 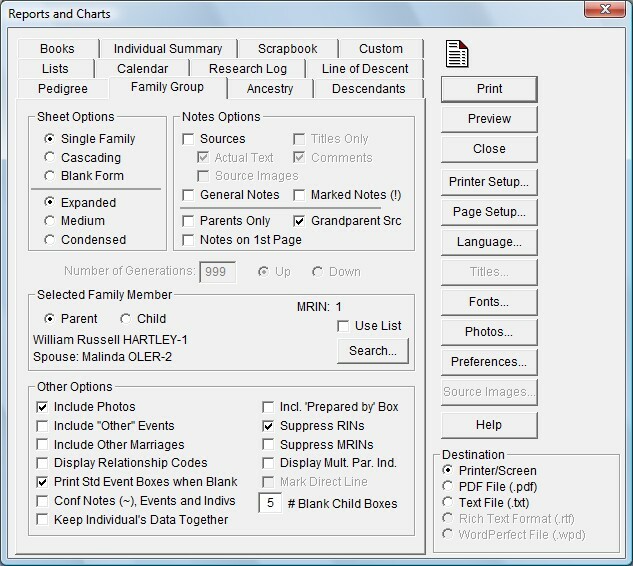 You can cascade these to print sheets for all your ancestors' families, or all the descendant families of an ancestor. Standard Ancestry Chart -- fits one page wide, for as many pages as it takes to display all of the ancestry of a person. Optionally, include siblings. Ancestry Wall Chart -- displays on as many pages as needed. You can send the output to a plotter to take advantage of pages up to 10' tall and wide. 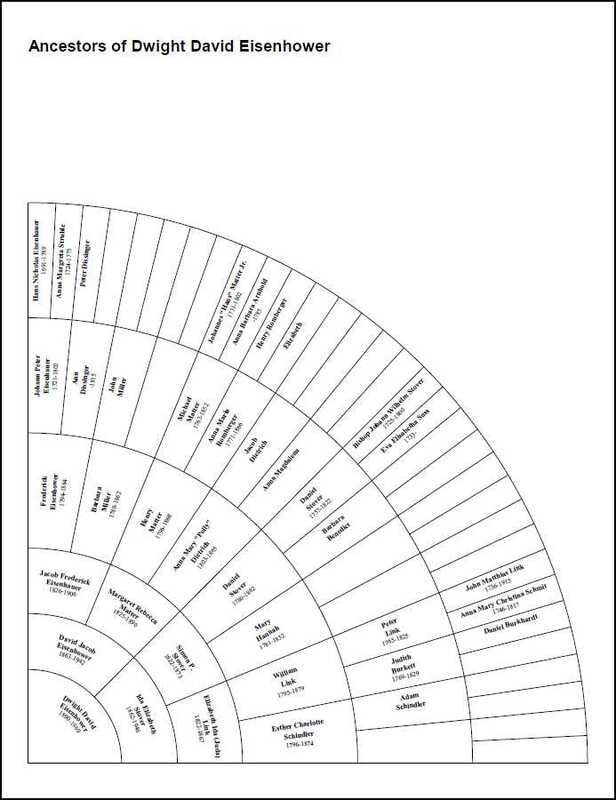 Standard Descendants Chart -- fits one page wide, for as many pages as it takes to display all of the descendants of a person. Book Reports -- Both ancestral (Ahnentafel) and descendant (Modified Register) book reports. These can be printed beautifully directly to the printer, or can be sent to text file, .rtf format (readable by most word processors, including MS Word), or WordPerfect format, so that you can make any personalized adjustments prior to publishing your book. Lots of formatting options allow some changes in basic layout from this sample. Individual Summary -- Print out all the information on an individual. If you want, include address and phone number. Birthday and Anniversary Calendar -- Select a group of people, like descendants of your father and of your spouse's father, then print a calendar of events to remind you of important dates. Sorted Place List -- Choose your fonts, titles, and which individuals (or All) should appear on the report. See all the events that occurred in that location, and find misspelled place names to correct. Scrapbook pages -- print all the attached multimedia scrapbook objects for an individual to scrapbook pages. Custom Lists -- define any group of people, and select any data fields. Sort the list and print it or send it to a file for import into other software. There is also a special Family Reunion Contact list. Get a list of all addresses, email addresses, or phone numbers for living relatives. The address list is ready for printing to labels. From the Source screens you can print lists of sources and citations. From the Relationship Examiner you can print the full relationship between any two people.